New York City Department of Transportation (DOT) Commissioner Janette Sadik-Khan today announced that DOT Street Safety Managers (SSM) are assigned to key bike and pedestrian corridors and bridge paths in Manhattan to help enhance safety among pedestrians, cyclists and motorists, further enhancing street safety as bike ridership grows, as DOT starts enforcement of commercial cycling laws and in advance of the 6,000-bike launch of the Citi Bike system. The SSMs will monitor locations with dense pedestrian and cyclist activity to reinforce existing traffic rules, advising bike riders to ride in the direction of traffic, yield to pedestrians and stop at traffic signals; instructing pedestrians to await traffic signals on the curb and not stand in bike paths; and discouraging cars from parking illegally in bike lanes. Shifts of four SSMs will be assigned to different locations in Manhattan weekdays during the morning and afternoon rush hours from April through October. In 2011, after the tabloids ran some over-the-top pieces about conflicts on bike/ped paths over the East River, DOT contracted with Sam Schwartz Engineering to staff the Brooklyn Bridge and the Manhattan Bridge with “pedestrian safety managers” tasked with keeping everyone in their respective lanes. The agency says this year it is saving some money by handing the expanded role of “street safety manager” to current agency employees during the peak cycling season. I don’t mind this at all. I really hope these SSMs will especially give hell to the salmon who CONSTANTLY ride down the 1st Avenue lane. I saw them at 10th St and 2nd Ave this morning, but they should be at that intersection in the evening. It’s generally pretty quiet in the morning. 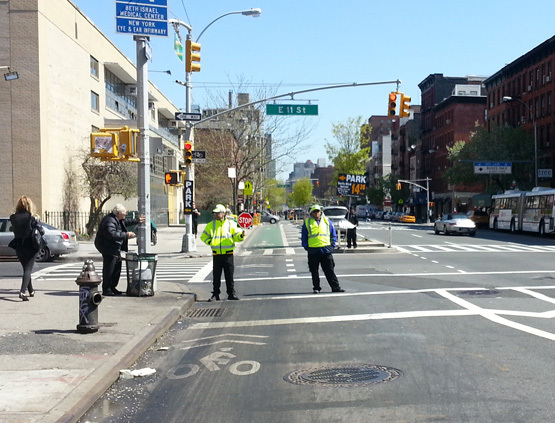 Another step toward DoT taking over the traffic safety work that NYPD does not want and/or is unable to perform. Let’s make it official and transfer from the NYPD to the DoT the funding and manpower for this and similar work–in particular, crash investigation. Is DOT also assigning Street Safety Managers to key automobile corridors to help enhance safety among pedestrians, cyclists and motorists? 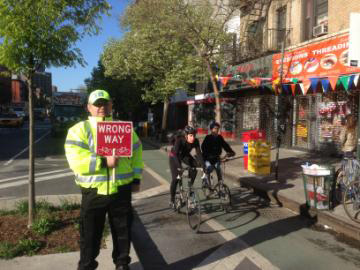 Are they reminding driver’s to yield to bikes when making left turns on 1st ave? I was very happy to see them on 11th and 2nd today. They were very friendly and set a number of cyclists in the right direction. Saw this in the AM. I heard one of the SSMs scold a pedestrian walking in the bike lane. It was kind of surreal. But here’s the thing. The light timing on 1st Avenue is terrible for cyclists. If you are starting at Houston St. a very brisk pace gets you to 14th Street where one needs to hustle again to make the light at 20th St(which is timed differently because of a nearby school). If I ride slower I wind up stopped at 12th Street and then 20th. That’s not terrible, but i’s not great either. If I go slower, I wind up stopped at 8th, 14th and 20th. You’re going to get people running red lights if the average person is going to have a red signal every quarter mile. If following the rules were faster, everyone would follow the rules. Also, if this reduces “shoaling” even a little I am in favor. As a pedantic observer of traffic rules, I have been mercilessly “shoaled” by every species of cyclist and if I have to pass one more person who came to a stop in front of me (usually in the crosswalk) I’m going to lose it. Mandating that cyclists follow rules that were made for motor vehicles and do not make sense for cycling as a transportation method is not a good goal. Waiting thru light cycles when there is no cross traffic and no pedestrians has nothing to do with safety and is a law that needs to be changed or ignored. The city does not ticket pedestrians for crossing against the light. The city recognizes that that law is not appropriate. The same needs to be realized for cyclists. I’ve been trying to discourage cars from doing this for years, but all of the cars I’ve discouraged don’t seem to listen! And for some reason they can’t look up photos of themselves on the internet, where I typically post the photos. Maybe the cars I’m discouraging don’t have microphones and voice recognition sensors to understand what I’m telling them! This is a pleasant surprise. JSK and DOT recognize that with our streets becoming more multi-modal, this is exactly the time when we should be molding the behavior of new street users before bad habits set in. We also need to curb the existing bad habits of other street users. No one class of street user is completely innocent and I’m sick of reading disingenuous comments designed to divert attention from one form of bad behavior to another. We all need to modify and improve our behavior to make the multi-modal future now being born before our eyes as functional and harmonious as possible. Amen! I am a cyclist, but I gotta say I too have grown so tired with the pattern of immediate deflection of blame. Yes, I realize drivers also disobey the law, but why can’t improvement of our behavior be an independent effort? Why can’t we just own up to our responsibility as cycling community? Traffic lights are a HUGE problem for cyclists citiwide, not just on places like First Avenue. I’ve been on streets where if I were to wait out reds, I would be be stopping every two or three blocks. I wouldn’t even really call that riding a bike. The elephant in the room which the city, and even most cycling advocacy organizations, fail to acknowledge is exactly what you said-cyclists will not stop for red lights if they encounter them very frequently. Besides the obvious severe loss in average speed, the simple fact is most cyclists are physically incapable of stopping as often as they would have to if they obeyed the law to the letter. Stopping every quarter mile equals 100 stops in one of my typical rides. I start getting leg cramps by about stop number ten. We need to set things up so cyclists rarely need to stop. Even allowing cyclists to pass reds wouldn’t fix the problem entirely. “Idaho yields” are still costly in terms of time/energy when you need to do them a few times per mile. The obvious solution is either grade separation, or decrease traffic levels enough so you can take out 95% of the traffic lights. What’s shoaling? Is that when someone cuts in front of you, then stops at a red light you intend to go through? I can see how that would be very annoying if that’s what it is. While on that subject, if I *know* I can’t go through a red light up ahead due to either cross traffic or police, I reduce my speed enough to roll up to it just as it’s flipping back to green. I feel incredibly vulnerable completely stopped. It’s also much easier to get going again, even from a few mph, than from a dead stop. A variation on this theme is hitting lights at speed just as they flip back to green. I do this on streets where I know the light timing cold. For whatever reason, it sometimes makes car drivers go nuts seeing a cyclist pass them at 20+ mph right as they get the green light. Often, these are the same morons who passed me a few blocks down at 50 mph only to have to slam on the brakes at the next light. It seems motorists never “get it” as far as adjusting their speeds to the light timings. Speaking of light timings, I don’t know how it is now, but back in 1981 when I briefly tried messengering I went from 125th Street to West 4th Street in 15 minutes flat. I forget which Avenue (it may have been 8th). The light timing was perfect that day-the lights were all flipping from red to green when I was a few car lengths from the crosswalk. The city can and should install sensors to ensure traffic lights only go red when something is actually crossing. It’s enormously wasteful for everyone, including motorists, to have to waste time stopped when nothing is crossing. It also fosters disrespect for traffic signals. In essence, the state is stealing people’s time for no good reason by having traffic lights when go red when nothing is crossing. The irony here is the concept of traffic signals was originally based on railroad block signaling. With block signaling, a train only gets a stop aspect if the block ahead is occupied OR the trailing points on the switch ahead are set to the diverging route (meaning another train is getting priority). You *never* have trains stopped if there’s no interfering traffic (the only exception being when the dispatcher is holding a train in a station because it’s ahead of schedule). Yes, we should change the law to allow cyclists to treat reds as yields, but at the same time we should fix the problem so this will rarely be necessary. I wish this practice was confined to “serious” cyclists or aspiring alley cat racers, but I am consistently shoaled by people on ancient squeaky bikes or fancy gents on dutch behemoths weighing several tons. I can’t tell you the number of times that I’ve been shoaled only to pass the offending cyclist in the vary same intersection. I have been in situations in which I have passed the same people over and over again only to have them squeeze their way ahead of me at every red light. OK, I can see how that would be *very* annoying. I’ll generally only “shoal” if I come up on a cyclist whom I was already gaining on when we were both in motion, on the theory that he/she will never catch up to me once the light changes, and I’ll be passing them eventually anyway. In that case, passing is safer when we’re both nearly stopped. Yeah, little point getting in front of a faster cyclist only to have them pass you again and again. That just makes things more dangerous for everyone. What are you Frank Costanza. Don’t stop short and you won’t get shoaled. I think it’s a good move for DOT to help the city move towards a safer environment for all users. “Stop short?” You mean stop legally behind the white line before the crosswalk? Because that’s how I get shoaled – I stop where I’m supposed to, only to have a throng of cyclists stop in the crosswalk, usually as pedestrians are crossing. It’s pointless, it’s rude, and it’s illegal. Exactly. And yeah I know that there are some intersections where being in front of turning cars is valuable and helps avoid right and left hook collisions but most of the time, it’s just idiots cutting the damn line. I was just making a Seinfeld joke, although, I don’t know if “shoaling” is always evil. I certainly do it from time to time. I don’t have a “strict” no shoaling rule (though, I’m probably the one passing people then getting passed). So if I came upon you at 23rd street and First Ave, I’d probably wait for the peds to finish crossing and then I’d “shoal” you and move up through the cross-walk and cross 23rd while still red (since cross-traffic slows considerably) to get a head start.. But I could see, based on your experience, how it could be a top pet-peeve. Mine probably are: (i) left hook drivers who don’t yield (seen many close-calls with trucks that didn’t yield), (ii) Salmon and (iii) general discourteousness (which I don’t necessarily include “shoaling” as I believe it depends on a case-by-case basis). I think shoaling, if we define it as the notion that most cyclists want to stop in front of other cyclists, is largely a myth. Some cyclists do stop on the crosswalk or even after the crosswalk, on what would be the extrapolated parking lane from the cross street. But they do it even when there are no other cyclists around, casting doubt on the notion that they want to be in front of other cyclists. They do it to get ahead of the cars, either to be more visible (creating their own “bike box” when there is none), or to be in a good position to run the red light. I’m not saying the practice is right, but I find my theory much more plausible than the idea that “most cyclists” can’t bear to wait behind another cyclist. It would still be great to see more queues before the crosswalk in NYC. Apparently that’s how they do it Down Under. Defined so narrowly as to redefine it, shoaling might be a myth. But the practice of cyclists pointlessly pulling ahead of other cyclists and blocking those cyclist as well as pedestrians and of course often trackstanding a couple of feet into the crossing traffic lane is no myth. I deal with it every single day. And almost invariably I pass these dupes ten seconds after light changes. My point is that people who complain about shoaling tend to personalize it. Basically, they say “how dare that cyclist cut in line in front of ME!”, when a more likely explanation, in my opinion, is that the other cyclist just prefers to stop at a more forward position (legal or not), and would have stopped there even if you weren’t present at all. I do not condone blocking the crosswalk, but I don’t care if someone chooses to stop ahead of me. I admit it’s mildly annoying when it’s a slow cyclist whom I have to pass multiple times, but that’s not even close to the top of my list of pet peeves. The NYPD should be doing this. Not the NYCDOT. Full stop. Sounds like NYC, like Chicago, needs some bike-biased “green waves” (http://en.m.wikipedia.org/wiki/Green_wave). Riding the Dearborn lane through Loop creates the same red light predicament discussed above, where if you don’t speed up or run a red, you’ll get stuck at every intersection. This is a neat idea. I’d love for an SSM to encourage pedestrians on the Williamsburg Bridge to stop walking up the bike ramp on the Brooklyn side, the ped entrance is right around the corner and it’d be much safer for everyone if they’d use it. Why aren’t cyclists required to have lights on their bikes at night? I have nearly been hit several times at night because I couldn’t even see the bike coming down the bike path. I thought this was the law in New York state. Can anyone shed any like on this. NY State requires lights from 30 minutes after sunset to 30 minutes before sunrise. Unless NYC has a law that overrules that, it would apply everywhere. In well lit urban environments, lights are necessary to see where you are going though, so many more people forego them (illegally). In rural places, it’s much more rare to see someone actually commuting without lights. These DOT people have been at the Manhattan landing of the Williamsburg Bridge the last two days. This morning, several of them lined up in a phalanx to prevent cyclists coming off of the bridge from going the wrong way on the Delancey St. lane. It was beautiful! And I thanked them profusely. This presence by DOT is definitely needed particularly at that location, where those fool cyclists go the wrong way on the bike lane, and then zoom onto westbound Delancey in the left lane, where there is virtually no room between the traffic and the island. While this manoevre is obviously dangerous, I really don’t care if a cyclist wants to risk himself/herself. The problem is that this kind of bicyclist behaviour, in front of crowds of motorists at all times of day, is embarassing, and promotes the perception of the lawless and reckless cyclist, thereby essentially begging the City to take away our bike lanes. 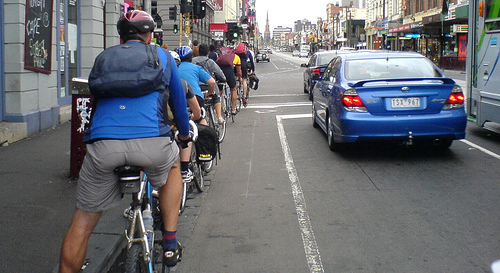 These cyclists do as much harm to the cause as cyclists who run red lights. We actually need some of these DOT people on the Williamsburg Bridge at the point where the bike lane and the pedestrian lane diverge, and also at the Brooklyn entry to the bike lane — in this case to curb bad behaviour on the part of pedestrians who walk on the bike side of the bridge. For some reason, pedestrians walk on the wrong side of the Williamsburg Bridge in much greater numbers than they do on the Manhattan Bridge. We all have the responsibility to follow the law if we want to keep our infrastructure; and pedestrians as well as bicyclists will suffer if/when the bridge lanes are closed in response to rampant abuse. Anyway, thank you, DOT, for attempting to save our bicycle community from the worst amongst us. Not defending these cyclists, but that’s really an awful, awful design. Why aren’t the bike lanes from the bridge extended into a bidirectional bike lane in the median of Delancy? To me that seems like a no-brainer. You have three blocks of Delancy where there are no roads crossing the median. That’s three more blocks cyclists can stay in motion without interfering with anybody. I personally think a flyover junction all the way to Allen Street would be even better, but for now at least use that median for something better than it’s being used for. That sharp turn for bikes right at the bottom of a long descent is frankly a disaster in the making. I can imagine a cyclist who is using the bridge for the first time running right into that jersey barrier, especially at night. I’m all for better cyclist behavior, but let’s start by doing things to take account of the physics of riding a bike. Common sense says a bike builds up quite a bit of speed on a long descent. That means you don’t put barriers or DOT personnel right at the end of such a descent. My idea gives the cyclists another three blocks to burn off their speed from the descent, instead of slamming on the brakes and maybe doing an endover when they see those DOT guys. NYC law is front and rear lights from sundown to sunrise.